At J.S. Fisher Violins, we believe in providing students with high-quality violins at an affordable price. We offer superior instruments, chosen and professionally adjusted for their warm, pleasing tone and ease of play. We use high-quality synthetic strings, well-balanced, responsive bows with genuine horse hair, high quality rosin, and a proper shoulder rest. We also stand by our instruments, keeping them well-maintained and in good repair while you rent. We will repair most accidental damage at no charge. Some exceptions apply. Please see the rental agreement for full details. A valid credit card is required and all payments are non-refundable. At this time we are offering rental services only to our local customers in central Pennsylvania. Our standard violin rental outfit features a beautiful Samuel Eastman model 100 violin, hand-carved from solid spruce and maple, professionally adjusted, and setup with high quality synthetic strings, as well as a stiff and well-balanced fiberglass bow with genuine horse-hair, shaped case, rosin, and a proper shoulder rest. Available in 1/16 - 4/4 Sizes. When we receive your completed rental agreement form, we'll call to discuss instrument sizing and to arrange a time to meet with you, personally. Questions? We're happy to help. Call us at 800-372-4151 or email: info@fisherviolins.com. If possible, please ask your child's teacher to measure and recommend the most appropriate size of instrument for your child. Teachers often have particular preferences for how students are sized. 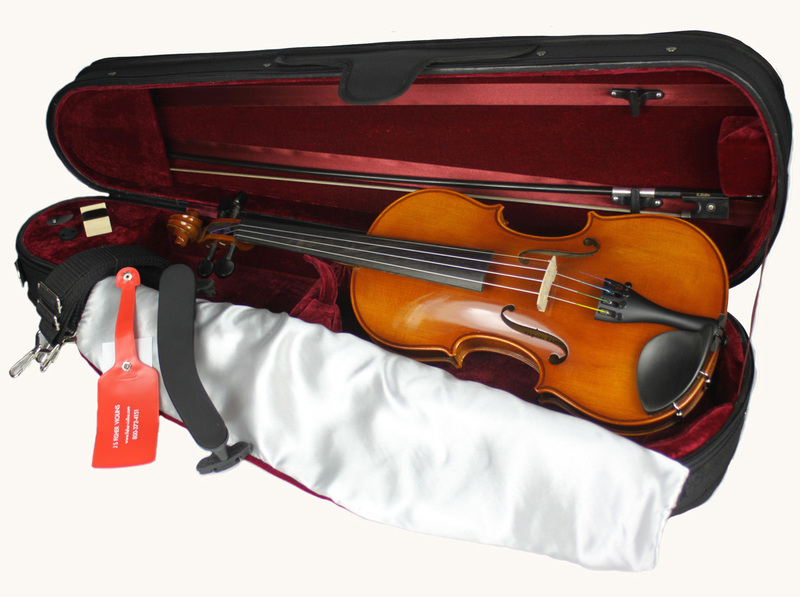 To read about how we size students for violins, visit our violin sizing page.